Later this year, the ABPMR will begin inviting a randomized group of diplomates with certificate expiration dates between 2019-2022 to participate in the ABPMR CertLink MOC Assessment Pilot, which begins in 2018. Participating in the pilot will involve a time commitment and thoughtful engagement with surveys and other feedback tools, and participants will still have to take the secure MOC Examination. If you're invited to participate in the pilot, we're offering some incentives to encourage you to say yes. What kind of time commitment will be required? For the ABPMR, the CertLink pilot will consist of 20 questions per quarter. Another ABMS board currently conducting its own longitudinal assessment pilot has reported their diplomates take an average of 35 minutes to complete 20 questions (they allow 5 minutes per question). Because our pilot allows 2 minutes per question (and your performance might mean you have to answer fewer questions), we anticipate you'll spend even less time on CertLink per quarter. For now, our generous estimate is 30 minutes per quarter, or a maximum of 2 hours per year. Why do pilot participants still have to take the secure MOC Exam? The long-term goal of the pilot is to eventually demonstrate that longitudinal assessment is an accurate measurement of knowledge and skills. Right now, the tool we use to measure that is the MOC Examination. By taking part in the MOC Examination and the longitudinal assessment, we can measure your performance against those of your peers who didn't have access to CertLink before their exam. We hope to show that participation in the CertLink pilot promotes learning and leads to higher examination performance. Waived annual fee. As long as you're fully participating in the pilot, we'll waive the usual $200 annual MOC fee. Self-Assessment Credit. We're still working out the details on this one, but because CertLink participation constitutes a self-assessment activity, you'll get credit (or a waiver) for that part of MOC (amount still to be determined). Practice Improvement Project (PIP) Credit. By participating in CertLink, your MOC Status will show credit for one completed PIP. 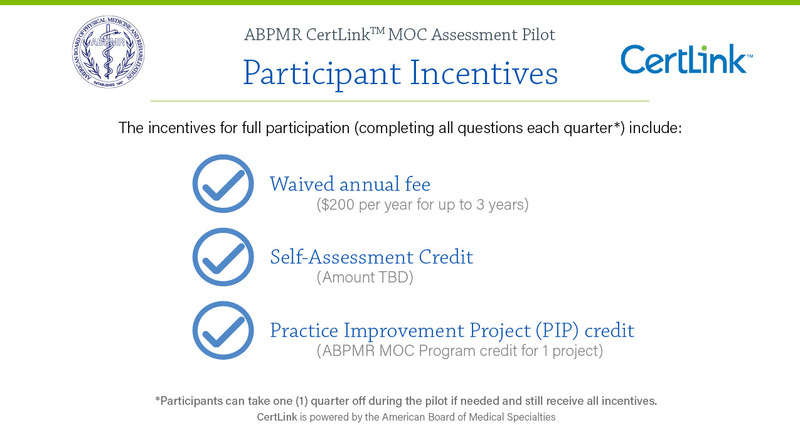 The ABPMR is considering the CertLink MOC Assessment Pilot a sort of PIP for our organization, so we're giving you credit for the part you're playing in that. When will I know if I've been invited to participate in the CertLink pilot? We plan to send out invitations later this year. We'll make an announcement when we're doing so, but if you're selected we'll be sure to let you know. Any questions? Please call or send us a message to ask.